We all love a warm and hearty home-cooked dinner, but let's face it: battling through rush hour traffic after a long day's work seldom leaves us with the time (not to mention the energy) to prepare such a meal. And when peering into the fridge for a minute or two yields no inspiration, we all inevitably pull some ready-made frozen meal out of the freezer and pop it into the microwave. Thank goodness for modern options, especially if this is the third time this week that you've reverted to this fabulous fail-safe. After all, ready-made meals aren't that bad, are they? A ready-made meal is a prepackaged frozen or fresh meal that requires none or very little preparation besides heating up. And, luckily for us, ready-made meals have come a long way since macaroni and cheese TV-tray type dinners. You can now find gourmet meals ranging from specific cultural cuisine to organic and vegetarian options. The latest, and possibly the healthiest, are packaged in such a way that the container functions as a steamer, allowing rapid cooking of essentially raw ingredients (typically fish or chicken and vegetables) immediately before consumption. 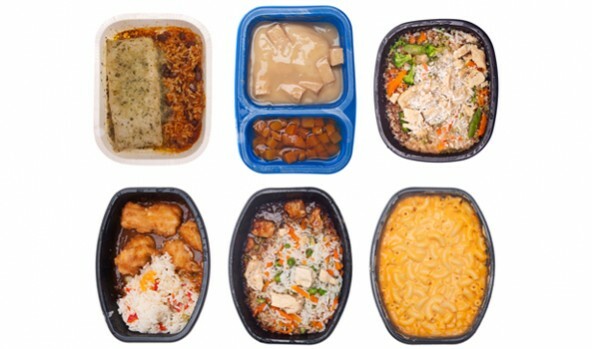 It's no surprise that frozen ready-made meals are popular. They're fast, convenient, inexpensive, easy and preportioned. The challenge, of course, is to find healthy ready-made meals that taste good, satisfy your hunger and won't sabotage your diet. The freezing process in frozen ready-made meals tends to degrade the taste of food. To compensate for this, the meals are processed with extra salt and fat to add flavor. In addition, stabilizing these products for a long period typically means that preservatives and unhealthy vegetable oils will be used on some items. There is, however, some variability between brands, so you'll need to read the "nutrition facts" panel on the package to see whether your choice is a healthier one. Unfortunately, most ready-made meals aren't properly balanced. They either provide too much starch or none at all, some are far too high in protein and fat and the majority of them do not contain enough nutrients in the form of vegetables or salad. To top it all off, most ready-made meals come in servings that are too big, so it is important to portion them correctly. Portions and Servings: What's the Difference? A portion is the amount of food that you choose to eat for a meal or a snack. It can be big or small; you decide. Many of us regularly eat bigger portions than we actually need. Over the years, portion sizes have increased (portion distortion), causing normalization of large portions. Portion sizes of many ready-made meals, other ready-to-eat prepared food and foods served in restaurants are much larger today than they were 20 years ago. Larger portions lead to increased food and energy intake, making it more challenging to achieve and maintain a healthy body weight. A serving is a measured amount of food or drink, such as one slice of bread or one cup of milk. The suggested serving sizes are selected by the food manufacturer. Many ready-made meals actually contain multiple servings. With packaged foods, you can see how many servings are in one container by referencing the nutritional table. For example, look at the label of a 500g ready-made meal such as lasagna (typically consumed as one portion), and you'll see that it actually has 2 servings in it. So, when a ready-made meal is the most practical solution for dinner, what should you look out for? Choose meals that are about 250g per serving or ensure that your serving size is this amount. To balance the ready-made meal, add at least two fistfuls of vegetables or salad. If vegetables or a salad are not an option, include a piece of fresh fruit as a starter or dessert. In general, look for meals that include vegetables and whole grains as well as lean meat, fish or poultry. These tend to be lower in calories and higher in vitamins and minerals as well as fiber, which helps fill you up. Check the nutritional analysis provided, making sure that the values are per serving and that this is the portion you consume as well. Remember to look at the "per serving" values and not the "per 100g" ones. Food and Nutrition Board: Institute of Medicine. Dietary Reference Intakes for energy, carbohydrates, fiber, fat, fatty acids, cholesterol, protein and amino acids published by the National Academy Press in 2002 states that to maintain a healthy weight and not encourage obesity, as required by the food labeling regulations mentioned above, the average energy intake recommended per day for women is 1,430 - 1,900 cal/day. The following items are easy to keep in your pantry and make for great (very low-calorie) salad additions: bottled asparagus, artichoke in brine, gherkins, peppadews, fresh herbs (basil, coriander, parsley, rosemary, etc. ), mushrooms in brine, pickled onions, sprouts and sundried tomatoes in vinegar. A selection of vinegars, low-oil dressings and herb salts are excellent choices, too. Slice a few cucumber slices and one large tomato and serve with torn fresh basil leaves. While warming up your ready-made meal, heat up 1 cup of frozen vegetables and season with any fresh herb or herb salt. Grab a handful of cherry tomatoes with some rocket leaves and serve with a splash of balsamic vinegar. Chopped cucumber, onion and snap peas mixed with a little plain yogurt and fresh coriander. Broccoli spears and baby carrots - lightly steamed, if you prefer, and seasoned with herb salt. Roast vegetables in larger quantities and keep them in the fridge for a few days. Why not create your own by cooking an extra batch or two of your favourite meal for the freezer next time you have the pots out? Simply stock up on some sturdy portion-sized plastic containers and freeze a few meals. Bookstores and the internet abound with low-fat recipes and tips on cooking for your freezer; by doing it yourself, you can ensure that your family members get all the nutrients they need, even when the meal is a microwave miracle! Celynn Erasmus is a registered dietician, author and professional speaker. She has a passion for demystifying the complex science of wellness and nutrition into sustainable tips and techniques for people on-the-go. Connect with Celynn at www.celynnerasmus.com or join the Wellculator community at facebook/wellnessprofessional.